Everywhere I have served as a pastor I have had a group of clergywomen to whom I could turn for support and encouragement—a safe space to talk with colleagues who understood. Women pastors need such spaces because, even though we are less and less unique (as of 2013 36% of Presbyterian Church (USA) pastors are women) we are oftentimes still treated as unique by the Church and her members. After my move here to rural Illinois, away from parish ministry and into college chaplaincy, finding a group of clergy women was difficult. Connecting to the RevGalBlogPals community has helped me not feel so isolated. I’m proud to be a contributor to this collection of essays. As I have been reading through it, I keep returning to the Table of Contents. I just love seeing all those female names listed with the title of “Reverend.” Resonating with essay after essay I look these clergywomen up on Facebook and Twitter to learn more about their lives and to connect with them through social media. I am hungry for this company of women and for these stories to be told. I really think churches should study this book so they can better understand what their female pastors are experiencing. Those who don’t believe women should be in the pulpit should read it too. Then they might realize just how wrong they are. When I read this book I can’t help but think, these women are good–seriously good–at what they do. It’s an honor to be included among them. 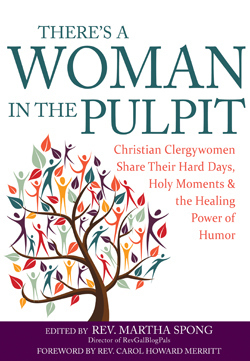 There’s a Woman in the Pulpit: Christian Clergywomen Share Their Hard Days, Holy Moments & the Healing Power of Humor is available for purchase through the publisher, SkyLight Paths Publishing. It can also be purchased at Amazon or through Barnes & Noble.